A viral Instagram post inaccurately claimed 14 girls went missing in DC in 24 hours — but the number of black people missing across the US is staggeringly disproportional. In Washington, DC, and across social media, there's been a massive public outcry in response to an apparent lack of attention to a large number of missing black girls. 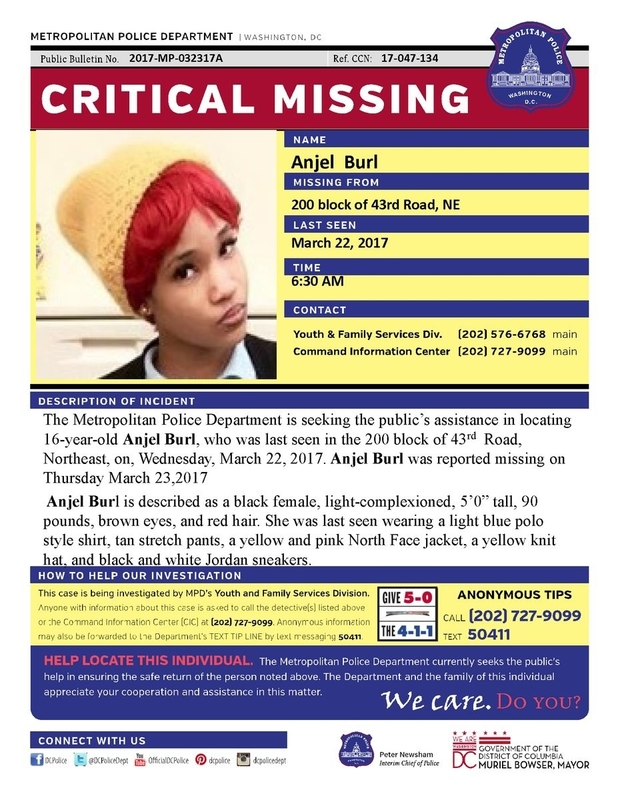 The growing chorus calling for action comes after DC police began a new practice of publicizing missing person flyers on Twitter in hopes they could be located faster. 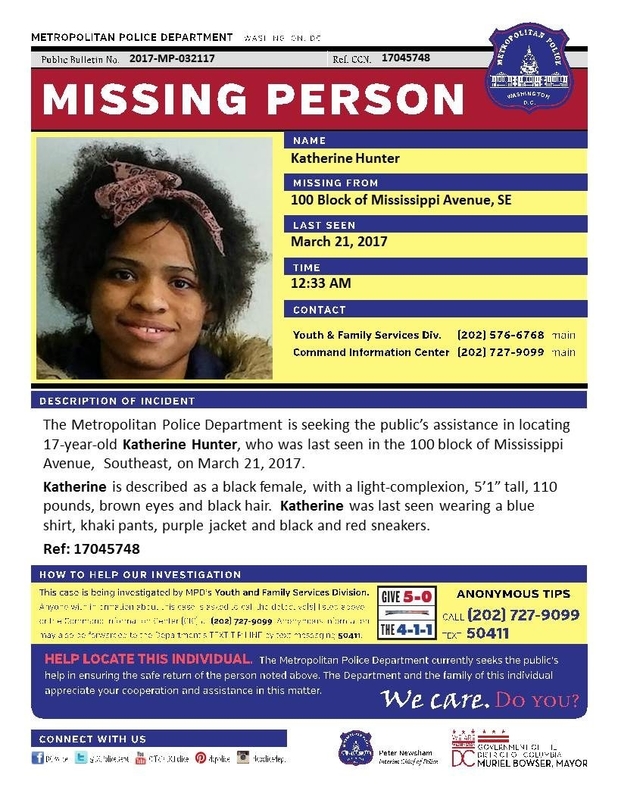 Police have tweeted 20 missing person flyers since March 19 (10 of which are for minors), which has led many to believe the number of missing persons has dramatically increased — however, DC police told NBC Washington this is not true. "We've just been posting them on social media more often," Rachel Reid, a spokesperson for the DC Metro Police Department, said. The number of missing person reports in DC has actually decreased in 2017 compared with recent years. DC police told USA Today that an average of 200 people have been reported missing each month for the past five years. This year, the average number of cases per month has been 190. So far, there have been 501 missing children cases in 2017. All but 22 have been solved as of Friday, according to NBC Washington. Officials said 99% of missing person cases from between 2012 and 2016 have been closed, leaving just 16 of 19,000 total cases open. The outcry came to a head Thursday when a viral Instagram post claimed, incorrectly, that "14 Girls Have Gone Missing in DC in the Last 24 Hours." Can someone explain to me how 14 black girls go missing in 24 hours in DC and it's not a goddamn news story?!? Police told NBC Washington this report was not true, and that in recent weeks there has never been an instance of 14 girls going missing in DC in a single day. Even so, the information spread like wildfire. New York Daily News writer Shaun King pointed out that some of the girls in the viral Instagram post have actually been missing for several years, and not all of them are from DC. The photos were pulled from a story he wrote on Wednesday, titled "It's no accident that we hear so little about missing black girls in this country." Despite a widespread belief that the missing persons were kidnapped, all of the teens reported missing in 2017 left voluntarily, Metro Police spokesperson Karimah Bilal told NBC Washington. "Because of the number of releases, there have been concerns that young girls in the District of Columbia are victims of human trafficking or have been kidnapped," she said. Bilal also said there's no evidence that the missing teens' disappearances were related to human trafficking. "We look at every case closely to make sure that doesn't happen, but to my knowledge, that hasn't been a factor in any of our missing person cases," Bilal said. Even so, the number of black people missing across the US is staggeringly disproportional — though that's not a new phenomenon. According to the Black And Missing Foundation, 36.7% of missing people under 17 are black. Very few of these cases receive widespread media coverage — especially when compared with the "missing white woman syndrome" that often follows the disappearance of white women in the US. And now lawmakers are starting to take action. In a letter obtained by the Associated Press on Thursday, black Congress members called for the Justice Department to step up and help police investigate missing children cases in DC. Penned by Congressional Black Caucus chairman Cedric Richmond and DC Congresswoman Eleanor Holmes Norton, the letter asked Attorney General Jeff Sessions and FBI Director James Comey to "devote the resources necessary to determine whether these developments are an anomaly or whether they are indicative of an underlying trend that must be addressed." And on Friday, DC Mayor Muriel Bowser announced new initiatives not only to find missing children but also to prevent future cases by allocating more money to organizations that assist teens at risk of running away.